Defiance 2050's HUD and UI elements are familiar for returning players from the original Defiance game, but new players might need a little explanation on what certain icons represent, or where to look for an information they might need. This guide's purpose is to give detailed information on these elements. Please note that this guide was made using the PC client as an example, therefore you might find some differences if you play the game on Xbox One or Playstation 4. This section will be grouped by the area of the screen where the elements appear. The maximum EGO level that you can reach is 50. Not to be confused with Class level. The name you gave your character during character creation. This can be the same as the account name you chose when first logging into the game. This bar will appear light blue if you have a shield equipped, orange if armor, or completely missing if you use a shield that grants Hitpoints only. You can read more about armors and shields on the Shields page. This value is the average of your primary and secondary weapons', your shield's and your grenade's Power Rating. This value represents how strong your character will be in combat. The higher the value, the further you can wander into the playable area of Defiance. This value currently can go up to 5000. If the icon is full (as shown above), your self revive is ready to be used. Using the self revive will start a cooldown period. During this cooldown the icon will slowly appear from bottom to top as the cooldown expires. The cooldown can be lowered by certain perks or completely refreshed by going near a Revive Spike of a Combat Medic. If you get incapacitated while your self revive is on cooldown, you can only be revived by other players for a period of time, and if that period expires, or you choose to extract yourself, you'll be extracted to the nearest Extraction Point. Usually this will be only damaged when your shield or armor is completely broken, however, it is possible to take damage directly to health even with shield or armor on by certain Nano Effects. Your inventory is full - in this case the rewards that would go to your inventory will be placed into the Claim Items screen. This isn't applicable to items found on the ground, those cannot be picked up if your inventory is full. By Default you have 40 inventory slots, that can be expanded by spending Valor or Bits in the Defiance Store. Your Ark Key capacity is full - Ark Keys can be used to open crates at the end of major arkfalls and at the end of Co-Op maps. 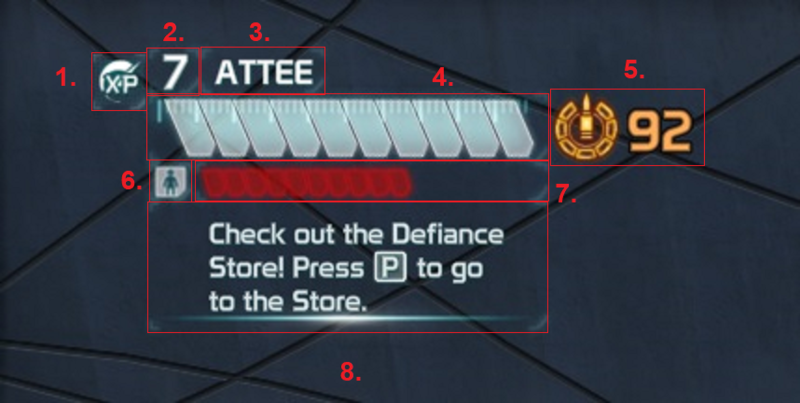 By default you can hold 5 of them, but can be expanded using Bits in the Defiance Store. These are the active abilities you chose and unlocked during your progress in the class you use in your current loadout. The numbers under them represent the keyboard shortcut to active them. You cannot change the order of the abilities, the lowest tier ability is on the left, and the highest tier is on the right. If the icons appear bright (as shown above), the ability is ready to use. When you use one of them, the icon of that ability will be dimmed to let you know that they are on cooldown. If the ability has a duration, then the dimming will appear from top to bottom, reaching the bottom of the icon when the duration expires. During the cooldown period the bright appearance will appear from bottom to top, until the icon will be completely bright again when the ability is ready for use. Please note that you cannot use abilities from 2 different classes at the same time. This area appears slightly different on consoles, the icons are smaller, and no separate shortcut button shown for them, because the abilities are activated by button combination on controllers. The button you need to press for a certain ability will be shown on the middle of the screen when you hold the first button of the combination. The icon will change according to the grenade type you equipped. In Defiance 2050 you have unlimited amount of grenades, but there is a cooldown on them. The cooldown period is shown with a dimmed icon in a similar way as with the abilities. The cooldown period of a grenade is affected by the grenade's rarity (higher rarity grenades have lower cooldown period), and can be lowered by perks. The icon represents the weapon / vehicle model you use instead of the type of them, therefore 2 weapons of the same weapon type (for example Assault Rifle) might have different icons. Prototypes have unique icons. Weapons can be equipped with Ammo mods on the Enhancement screen if they have an unlocked Ammo mod slot (if the Ammo mod slot not unlocked yet, it can be unlocked on the Enhancement screen using Caeruleum cores). If your weapon doesn't have a Nano Effect, there will be no icon shown. Prototypes may have Nano Effect by default, but it cannot be changed, as Prototypes cannot be modded. You can read more about Nano Effects and their use on the Nano Effects page. This bar will display your skill's progress towards the next skill level for the currently used weapon type or currently driven vehicle type. You can check your current skill levels and the current and upcoming bonuses of them on the Stats screen. Please note that the skill progress bar on the Stats screen represent the progress towards the maximum skill level instead of the progress to the next level. The maximum skill level for each weapon type is 50, and the maximum for each vehicle type is 20. This counter shows the amount of scrip you currently have on the character you play with at the moment. Scrip can be earned by completing various open world activities, missions, Co-Ops, or by selling your unwanted items to vendors. Scrip can be used to buy items at vendors. The amount of Scrip you have is counted separately for each of your characters, and you cannot transfer it from one character to another. Please note that the correct spelling of this currency is Scrip, even though many players misspell it as Script. Ark Key is a valuable resource that can be used to open Ark Chests after completing a Major Arkfall or a Co-Op map. Even though Co-Op maps will have 3 chests after completion, you can only use one of these keys at a time, so you will have to make a choice which chest you want to open. Ark Keys can be earned from certain Main Missions, and after reaching EGO 50, from completing daily and weekly contracts. This bar stretches across the whole screen, and shows the progress towards the next EGO level with a light orange tint. The bar is split into 20 smaller segments, each of them represent 5% progress towards the next level. When you reach the maximum EGO level, this progress bar will remain, but will appear empty. You can read more about character progression on the Defiance 2050 - Progression page. This points to the North. In the settings you can set the mini map to rotate according to where you look, or to fix the mini map, and have this marker to always point upward. 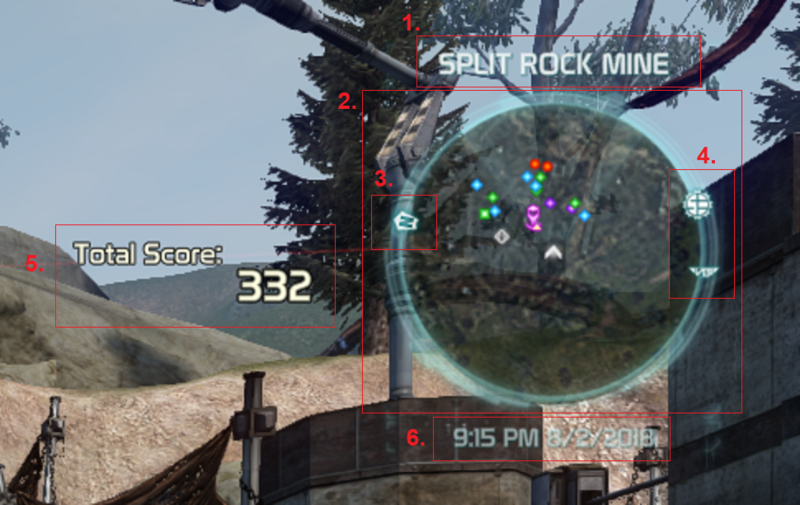 In this case the "You" marker will rotate instead of the whole mini map. This will display your current score. 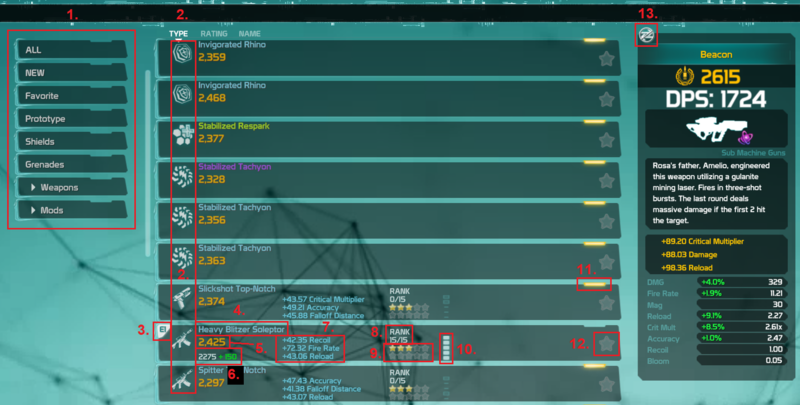 When you gain score, the amount you got and the reason will be shown under it for a few seconds in smaller font. You can see the current time in 12 h format and the date in MM/DD/YYYY format. The displayed time is based on your own time zone. The format of the time (12 h / 24 h) and the date format cannot be changed. If an NPC talks to you outside a cutscene, this will appear. It shows a thumbnail of the NPC and the name of it. You can also change the chat font size, the duration how long the messages will be visible (if set to maximum, the text will not fade), profanity filter, chat timestamps and colorblind schemes. This is optional, it shows the time when the message was received in 24 h format. It is disabled by default. This shows in which channel the message was sent. 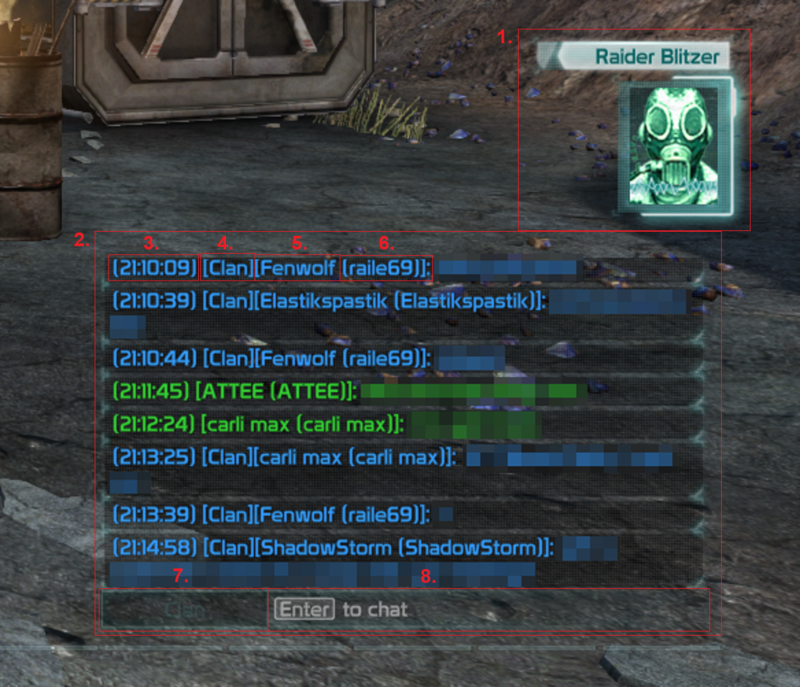 Not all channels have a prefix, but it is useful, because there are chat channels with same text color. This is optional, it shows the account name of the player who sent the message. This will be shown only if you enabled the display of account names at the gameplay settings. This is useful to identify players with multiple characters on the same account. Group - only selectable if you're in a group. Only those who are in group with you will be able to see this. Texts in this channel will appear in green. Team - only selectable if you take part in PvP. Only those who are on your team will be able to see this. Texts in this channel will appear in cyan. Clan - only selectable if you're in a clan. Only your clanmates will be able to see this. Texts in this channel will appear in blue. Officer - only selectable if you're in a clan. Only officers, leaders and the founder can see this channel, however, you can send message in this channel (even though you won't see it yourself). Texts in this channel will appear in the same blue color as clan chat, you can differentiate messages from this channel and clan chat channel only by the chat channel prefix. Area - this channel is always selectable. If you used a chat channel, that is no longer available to you, the chat will default to this channel. Only those who are in the close vicinity of you will be able to see this. Texts in this channel will appear in orange. Zone - this channel is always selectable. All people who are on the same map as you are will be able to see this, regardless of distance. If you use this in the open world, people who are in Co-Op maps, arenas or on an instanced PvP map won't be able to see this. Plese note that the open world is split into shards to spread the server load (think of these shards as parallel realms of the same open world, with different activities), and those who are on another shard won't be able to see your message. Texts in this channel will appear in yellow. Private chat - this channel is only selectable if you invite another player into private chat, and they accept the invitation, or vice versa. Messages sent in this channel will be seen only by that other player and you. If you, or the other player leaves the private chat, you won't be able to send another message in that channel. Texts sent in this channel will appear in pink. Not to be confused with whispers, which also use the same pick color. Trade chat - this channel is always selectable. This channel functions similar to Zone chat. 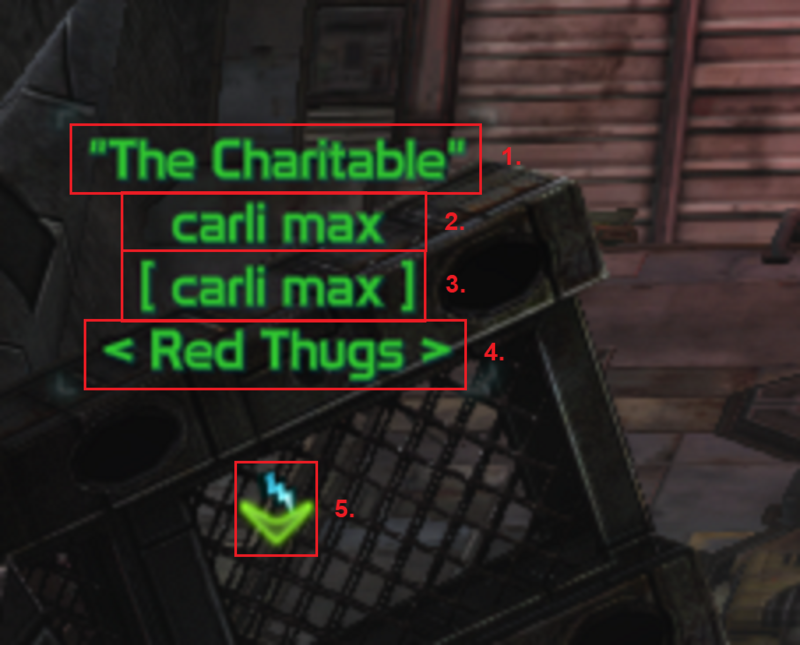 Texts in this channel will appear in the same yellow color as Zone chat. Your messages will appear here until you send them. Its usually used for chatting, but there are some chat commands that can also be entered here. The chat commands will be different if you change the game's language in Glyph to German or French, therefore the following table will contain each client's commands. Commands with the same functionality will be in the same row. The syntax examples will be using the English client's commands. Please note that commands that give you an automatic response will send the reply on System chat. If you don't have that enabled on your chat tab, you won't see the response. Enabling System chat on a chat tab isn't retroactive, you will have to reenter the command to see the response. /anfeuern /acclamer Performs the "Cheer" emote. The game shows skulls if an enemy will be a tough opponent. The more skulls are shown, the tougher the fight will be. The number of skulls can range from 0 to 5. Enemies have a minimum Power Rating, which depends on the region in the open world, and in Co-Op maps on the tier of the co-op. If your Power Rating is higher than this minimum value, the enemies will be scaled up according to your current loadout's average Power Rating. Shields will be shown as a very light blue, armor is yellow, and hitpoints are represented with a red bar. The Nano Effect of the attack of this enemy will be shown here, if the enemy has any sort of Nano Effect. If you pay attention to this, you can decide what kind of shield would be the most effective when fighting these enemies. This will only appear if the other player chose a title in his/her currently used loadout. This will only appear if you enabled the display of account names on the Gameplay settings screen. This can match, or differ from the character's name. This will only appear if the other player created or joined a clan. If the other player equipped 2 weapons with different Nano Effect, then only the currently used weapon's Nano Effect is displayed here, if it has any. If the item is equipped on a loadout slot, it will be shown here. If an item is equipped, it cannot be dismantled or sold to vendors. 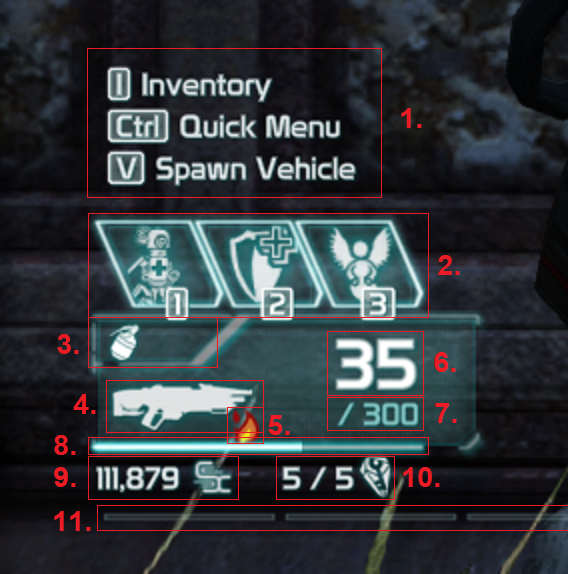 The number after the E represents the number of the loadout on which you equipped the item. This will be only shown on items that were enhanced. Each weapon has 3 random bonus rolls, except Common (white) rarity weaponry. You may reroll a weapon's bonus roll on the enhancement screen, and increase the bonus they give buy spending the Enhancement Bonus Points on the existing rolls. However, the more point you invest on a roll, the less increase will the next point grant. The Enhancement Bonus Points can be redistributed anytime on the Enhancement screen. Read more at Defiance 2050 - Changes from Defiance Classic guide. The amount of maximum enhancement ranks depends on the rarity of the weapon, higher rarity weaponry will allow more enhancement. This value is only shown on weapons, other items cannot be enhanced. The higher the condition, the better the damage of the weapon. Read more at Defiance 2050 - Changes from Defiance Classic guide. These rectangles represent the 5 mod slot of a weapon. If you get a new weapon, most of the mod slots will be locked and marked with a horizontal line instead of the rectangle. You can unlock a random mod slot on the Enhancement screen using Caeruleum cores. The unlocked mod slots will appear as a darker green rectangle, used mod slots will appear light green (as shown above). Mods can be extracted from the weapon using Caeruleum cores. Items that has a yellow line here represent new items that you haven't checked yet (didn't selected it). If you select it, this line will disappear. Weapons that you would like to keep and want to prevent an accidental dismantling can be protected by marking them as favorite. Favorite items will be at the top of the list of your inventory, sparing you from unnecessary scrolling in the inventory to find them. If an item cannot be traded or sold to vendors, it will be shown here. 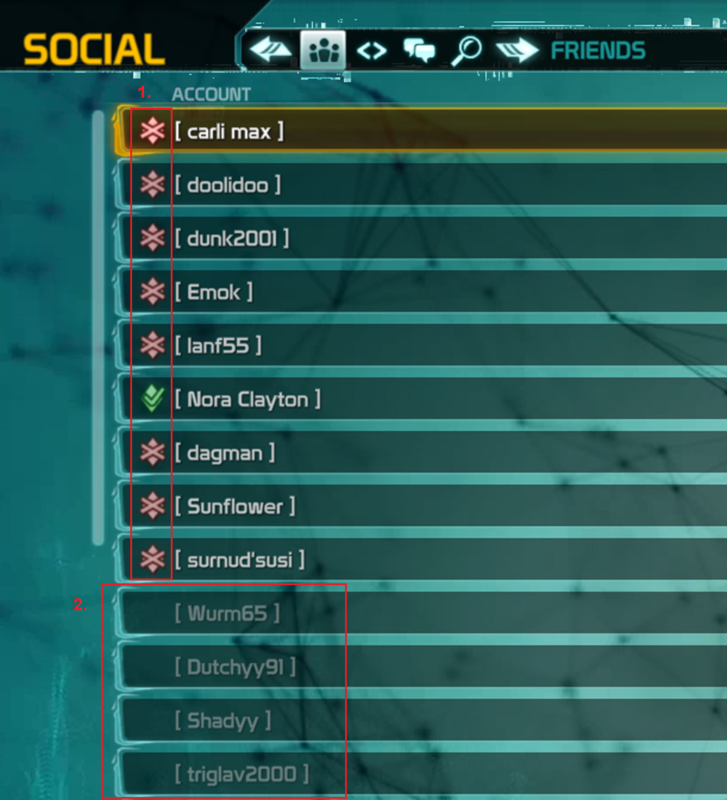 If you send a friend request to somebody, but they didn't accept it yet, then they will appear right under the list of your online friends, shown with gray font, and no shard indicators. Your offline friends will be also shown here, right under pending friend requests (if any), with same gray font, and without a shard indicator. The offline friends are sorted in a descending order by their time spent offline, meaning that your most inactive friend will be shown on top, and the one who was online most recently will be at the bottom of this list.